The original campus of Deakin University (38°11′52″S 144°17′50″E﻿ / ﻿38.1979°S 144.2973°E﻿ / -38.1979; 144.2973﻿ (Deakin University, Waurn Ponds Campus)) is located in the regional city of Geelong in the suburb of Waurn Ponds, 72 kilometres south west of Melbourne. 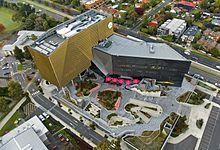 The campus, serviced by the Princes Highway and the Geelong Ring Road. It has a student population of more than 7,100 (2017).